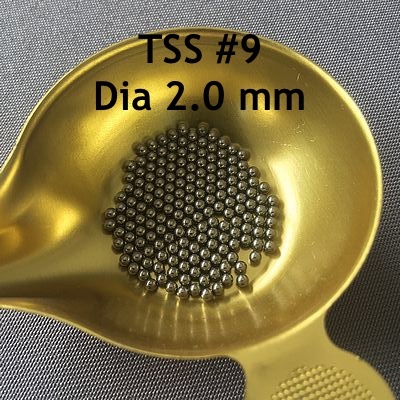 TSS #9, 2 mm in diameter is a very interesting ball. It is the lead equivalent of a ball of 5 at the level of penetration which makes it a marvelous ball for the duck, with a lethality a little more important than the 91/2. TSS # 9 (2.0mm) balls can be used to hunt all ducks, including mallards, up to a distance of 60 meters. Indeed, the penetration of 37 mm is reached up to 58 m and the pattern density at 60 m remains of almost 4 impacts per dm² for a charge of 32 grams classic. The load of 32 grams in 12 gauge is "THE" ammo to do everything to hunt waterfowl: immediate and significant lethal effect, good coverage and very low recoil. In small load (24 grams), it will be effective on all ducks up to 50 m with unparalleled shooting comfort and an excellent cost. Many hunters would not want to do without it.